Thanks. I'll see what happens after a reset. Worse case.....I need a new watch. Well, a factory reset on the watch didn't help. After all that time resetting and setting up again with several reboots to get on the latest version the battery displayed 91%. It's been about six hours since and it displays 89%. I forgot how common this was back in 2016 & 17 until I started searching. Lots of posts about this on lots of different Forums and support sites, with no real solution. Apparently it was very common after the initial Android Wear 2.0 upgrade. Oh well, I can't complain, my "worn once" watch for $125 has lasted me well over a year. Time to start looking at a replacement gently used Moto 360 Gen 2 or a Ticwatch. I'd go Tic or wait for the 3100 chipped watches. A dually I still have my friends Fossil if you like big watches. He'd sell it cheap. The Ticwatch has my attention right now. I like what they are doing......a WATCH that happens to run Wear OS. No frills, no thrills, just a watch running Wear OS. I don't need fancy and flashy, just functional and looks OK. Ticwatch is doing just that. Its odd. What you're describing is very similar to the behavior that my OG Turbo displayed when I used wireless charging. Battery calibration and reporting got all whacked out. I'd suggest trying direct wire charging, but I guess that's not really an option for you. No, not on a Moto 360. They charge via a wireless dock only. I'm still not 100% convinced the recent Wear OS app update is not part of my issue. I noticed on my wife's phone, which I have not yet updated the Wear OS app to the most recent app version, that she doesn't have the new battery % displayed on the app main screen. I think this was added by the app update the other day. And my problems started right after that. It could be a coincidence, and my battery just happened to fail right after an app update. 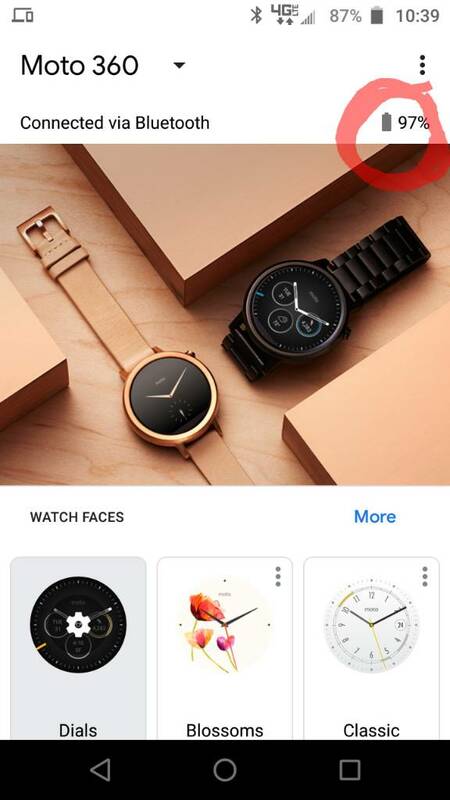 According to 9To5Google the new Wear OS Update H (with Android 9.0 Pie) is starting to slowly roll out to some watches. I think they stated some Fossil & Skagen watches right now, with more updates rolling out over the next few months. Sound off if you receive (or have received) the new Update H & let us know if you notice any notable improvements or differences. I found a new Moto 360 Gen 2 on eBay and bought it. Setting it all up now, and it's updating to some newer version. Let's hope the battery stats / battery health holds steady and no whacky issues. Posting this just as a FYI. I received an update to the Wear OS app this morning. After it updated, my phone and watch were disconnected. 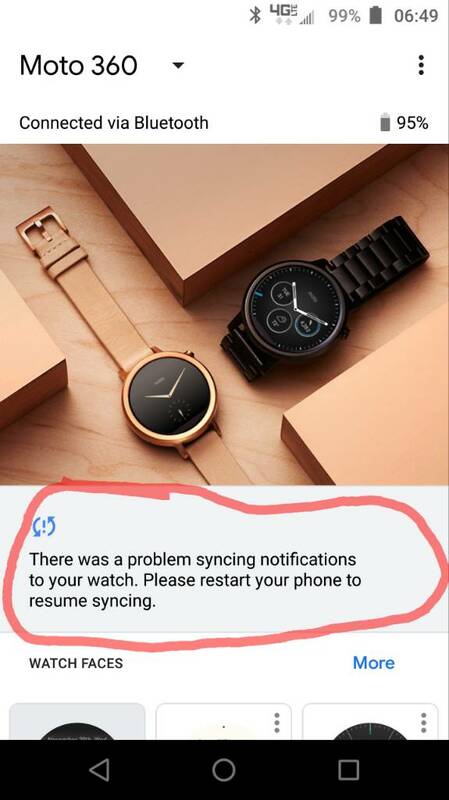 When I opened Wear OS I saw the notification in the screenshot. I've never seen that one before. A reboot of phone and watch cleared everything up and both are working correctly again. I also got that update but I didn't have that issue on my original Huawei Watch.